Whether you’re a beginner, intermediate, or advanced lifter, having an idea of your 1-rep max (1-RM) can help support your training. Once you have an understanding of the maximal weight your body can move, then you can program accordingly. Beginner and intermediate lifters can avoid the overtraining pitfall that can come with haphazard programming. In fact, strategic periodization is one of pieces of advice most athletes wish they had when they started lifting. Typically the advanced lifter already has an understanding that knowledge of their 1-RM is essential for successful programming. There are multiple ways to test for one’s 1-RM. Beginner, intermediate, and advanced lifters will benefit from different 1-RM tests. Newer lifters will usually lack the basic knowledge of how their body responds to maximal loads, which changes the way they should assess a 1-RM. Below will outline proper methods to test 1-RMs with compound movements for each level of lifter, plus how to prep for each. This lifter is new to the gym in most aspects and is probably still learning how to perform and perfect their lifts. At this point in a trainee’s career there isn’t a full understanding of how the body will respond under an extremely stressful situation. For a beginner I recommend using the NSCA’s estimated 1-RM formulas. These formulas are based off of literature that has composed mean averages of multiple-rep to max ratios. As in, if you can move a weight for five reps, then you can gain a general idea of what your 1-RM might be. Since beginners typically don’t know or have training percentages, then their warmup will be different than others. It will be based often on an athlete’s feeling and a coach’s assessment of their mechanics with the weight being moved. With beginners I recommend using a set rest time too. Since beginners are going off of a majority of feeling, then rest times can provide truer numbers. Advanced lifters should take the amount of time they need when supramaximal loading. 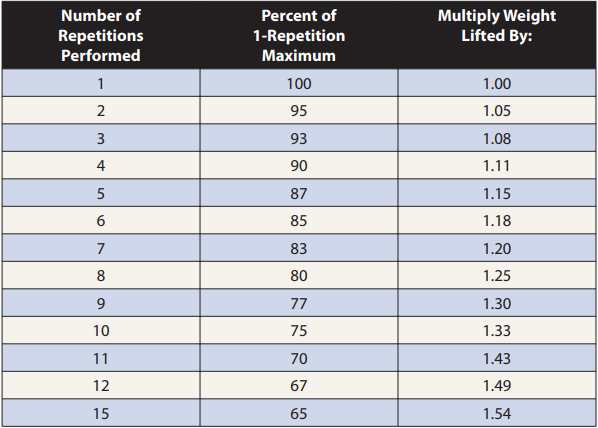 You’ll then take your final 5-rep weight and multiply it by the “1.15” used in the chart above. For extremely brand new lifters, I would recommend using one of the higher rep schemes (6-8). While this test isn’t completely accurate, it can provide direction for a newer lifter’s 1-RM strength. An intermediate lifter can test their 1-RM in multiple ways. A lot of this will vary on a case by case basis, as some intermediate lifters will be more advanced than others. This could be from previous lifting experience, sports, or even genetics. This being said, for a “newer” intermediate I would test 1-RM similar to a beginner. The only two differences being the final two sets and the rest times. The final two sets will be a lifter’s 3-RM weight and they’ll rest for the amount of time needed (as opposed to 3-4 minutes). Some intermediate lifters may not know their training percentages, so they can use the Rating of Perceived Exertion (RPE) scale as a tool to also help gauge intensity. A more advanced intermediate will test similar to an advanced lifter and the protocol will be the same as an advanced lifter posted below this section. An advanced lifter understands the compound movements, their body, and what it means to put their body under a supramaximal stimulus. They can typically perform true 1-RM tests safely without jeopardizing their body due to form issues. While this isn’t always the case, I’m speaking from a general point of view. At this point in a lifter’s career, they should have an idea of what their training percentages are, but can also use the RPE scale. The knowledge of training percentages enhances training in three important ways: better warmups, more accurate 1-RM tests, highly successful periodized programs. Pre 1-RM: Always perform a quality warmup before going into a 1-RM test. This will prep the muscles and nervous system for the stimulus that’s about to be placed upon them. The day before a test, try to take a rest day. In order to obtain accurate tests, the body should be fully rested before maximal lifting. Percentages vs. RPE: Percentages are great if you know them, but most newer trainees won’t. This being said, having an idea of how to use the RPE scale can be a good alternative for gauging training intensity. Coaches & Spotters: I always stress the importance of utilizing a coach and spotters when performing supramaximal tests. A coach can watch form and help you decide when and where you should stop. Spotters can assist you when lifts fail and help prevent injury.